Just when you think John Edwards couldn’t possibly be any more sleazy, then the rumors start. His wife, who initiated the divorce process until her cancer got the best of her, is still warm in her grave yet the talk is of marriage. 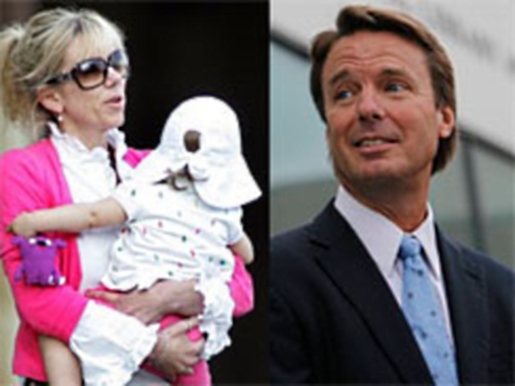 John Edwards is believed to be engaged to Rielle Hunter, his former mistress and mother of his love child Quinn. Granted, the story comes from the National Enquirer, but the supermarket tabloid was a Pulitzer nominee for their breaking of the story concerning John Edwards and his lovechild with former aid Rielle Hunter. It’s not official, and since the information has been leaked I imagine they might be changing their plans, but I wouldn’t put it past Edwards at all. After all, he slept with this woman while his wife was fighting off breast cancer, so he’s not got a very solid moral compass. I’d believe just about anything someone says about John Edwards at this point.